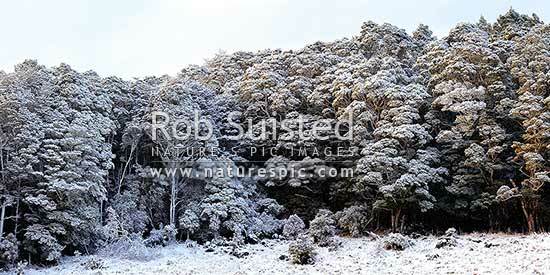 Silver Beech forest dusted with fresh winter snowfall as weather clears after snowstorm (Lophozonia menziesii, formally Nothofagus menzeseii). Canaan Downs. Panorama, Abel Tasman National Park, Tasman District, Tasman Region, New Zealand (NZ), stock photo.